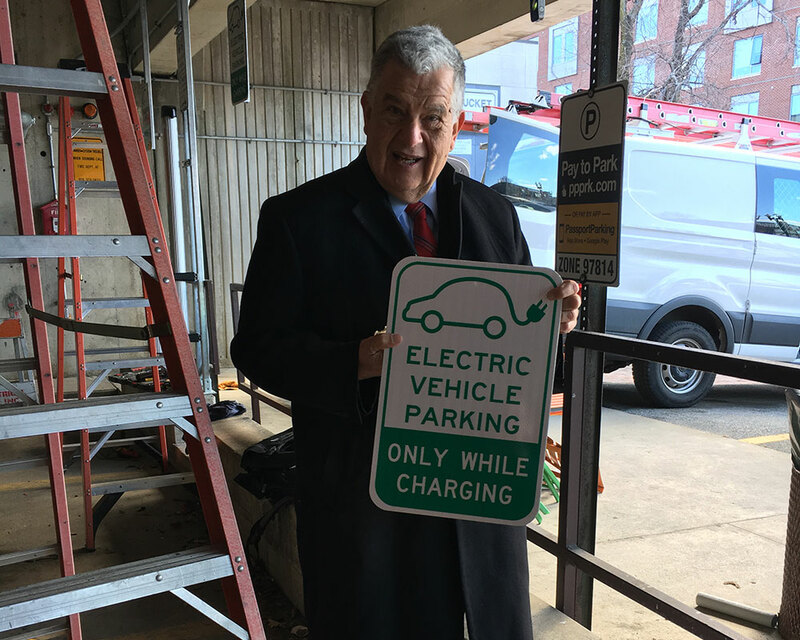 Mayor James J. Fiorentini touted the Haverhill of the future in this month’s State of the City address, and downtown’s Herbert H. Goecke Parking Garage is one step closer to that idea with the installation of three new electric car charging stations. WHAV joined Fiorentini on Merrimack Street Monday to inspect the trio of units expected to be up and running within the next week. Owned by the city and operated by ChargePoint, the units were installed over four days by Methuen subcontractor State Line Electrical on behalf of the Voltrek company out of Andover. “There is more and more demand for electric vehicle charging station, so this is a service for the public and residents, as well as part of the city’s ongoing efforts to be environmentally responsible and a green leader,” Fiorentini said. Each charging station includes two ports to accommodate two parking spaces and two vehicles, Fiorentini’s office said. The charging stations are 18 cents per kilowatt hour for patrons who also pay the garage’s normal parking fee of 50 cents per hour. Depending on the type of electric vehicle, cars can typically be charged in two to four hours. The three new stations join two at the MVRTA parking garage off of Railroad Square. Another station is planned for City Hall. That unit is available for public use and will also help service an electric car Haverhill plans to purchase for the Inspectional Services Department using Green Community state grant money. According to Fiorentini’s office, the charging units cost $13,000 each, including installation. The city funds the units through a combination of state grants and National Grid rebates.